O ne of the things I’m most excited about as I plan out our remodel is the fun of getting new appliances! I haven’t bought new appliances in a long time, I just used what we already had when we remodeled our last kitchen so I didn’t even look into what was available out there. Now I’m definitely starting to research and think about what we would want and it’s pretty fun to see all the new innovations! 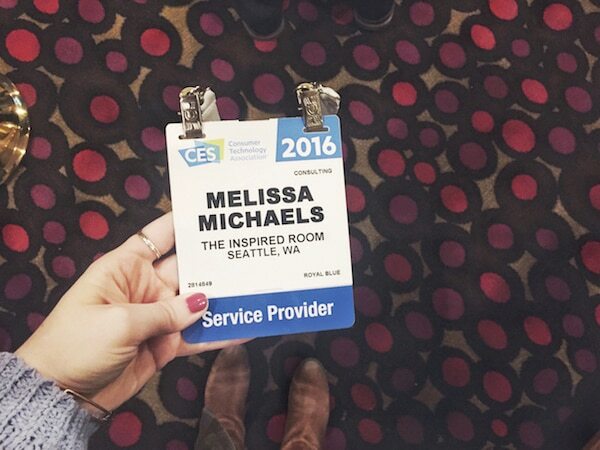 A couple of weeks ago I had the opportunity to attend the Consumer Electronics Show in Las Vegas (my first time in Vegas!). CES is a huge innovation conference. I was invited to attend with Samsung (along with The Everyday Man and Joe’s Daily) as one of their brand ambassadors, so it was really neat to be able to see their brand new appliances first hand. 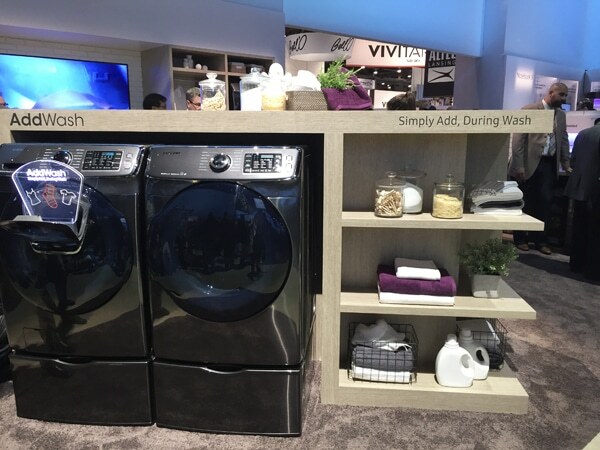 Today I thought I’d introduce you to two of Samsung’s new appliances I was especially excited about, the Family Hub refrigerator and the AddWash washing machine. I was pretty impressed at how far appliances have come since the last time I was appliance shopping. I love how these appliances could help make family life easier and more efficient. 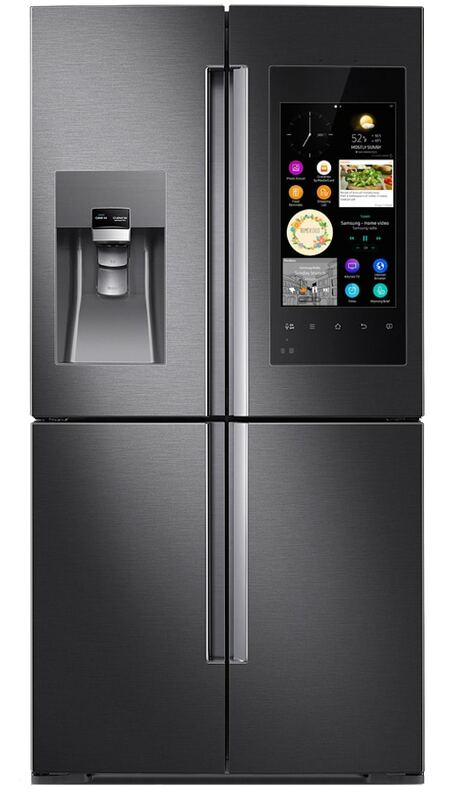 First of all, this is the awesome Samsung Family Hub Refrigerator. 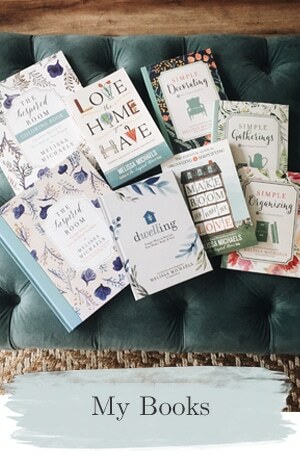 The busier our family has become and the more my business has grown, the more we are learning to use technology to keep ourselves sane and organized. While I still love my command center magnetic chalkboard on the wall and enjoy using paper notebooks and calendars, for coordinating our busy life I do use electronic calendars to color code schedules, set reminders and keep everything organized. So as a mom and business owner, imagine my delight when I saw this refrigerator. 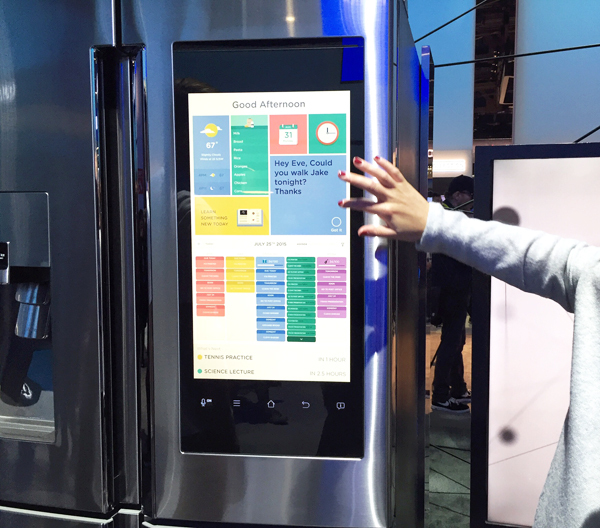 It features an electronic family organizing center right there on the fridge where everyone in the family can see it! Check out our video below for some of the highlights. It offers so many features that could be real time (and money!) savers while helping keep the family connected and organized. I also love that it has a FlexZone where you can decide if you want it to be a freezer or a fridge at any given time, that’s brilliant. If you’re interested in seeing more about the Family Hub, check out Samsung’s promo video about it here, it’s definitely worth watching! Next up was the AddWash washing machine. I shared about it a couple of months ago, but this time I actually got to see it in action! For those of you front loader fans, this machine takes laundry efficiency up a notch by solving one of the main limitations with previous front loaders. Samsung has added an extra door to the front design to finally make it possible to add in that stray sock you dropped, a bath towel that needs to get into your wash load, or even to add more delicate laundry later in the cycle. Check out our video above! Hope you enjoyed our sneak peek! 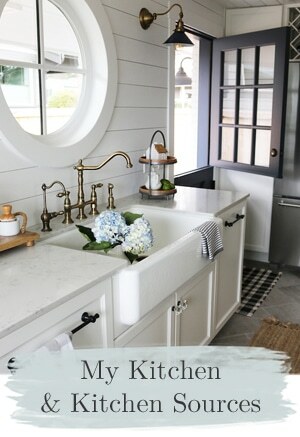 I can’t wait to share more plans for our upcoming kitchen remodel, including cabinet colors, counter and layout ideas! I am thrilled to be a brand ambassador for Samsung Home Appliances and this post was created as a part of my partnership. My experiences and opinions are my own. I’d be wary of any washing machine Samsung makes. We bought one and this past fall a hose blew out of it flooding our 2nd floor (that’s where our laundry room is). We spent thousands on home repairs and had the washer fixed under warranty only to have it do it again two weeks later. Then again a third time the next week. Our insurance company tells us it’s a known issue and has filed a lawsuit with Samsung to get our deductible etc back. Meanwhile we replaced it with an LG. I’ll never have another Samsung washer in our house. I’m sorry you had a frustrating experience, it sure is a bummer when you end up with an appliance that has a problem (no matter what brand it is). I had a Samsung washing machine for six years in a second floor laundry room (until we moved just a few months ago) and it was wonderful! No leaks or trouble at all! I hope you get things straightened out. That refrigerator looks amazing! Thank you for sharing, we need new appliances this year, too! Just moved into my new build home and bought all new appliances. This washer has real appeal. I see that some manufacturers are adding better features to the front loading machines and this one is inspired. 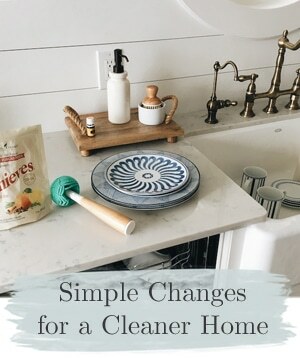 I personally like a cleaner ‘look’ to appliances so the refrigerator doesn’t appeal to my buying habits. But there are many choices available in their line. I had a Samsung in the previous house and liked it. Hope you had time to see a little of LV. First, Congrats on becoming a Brand Ambassador! Second, that refrigerator looks very complicated…lol! However, I am excited to see what’s new in appliances. 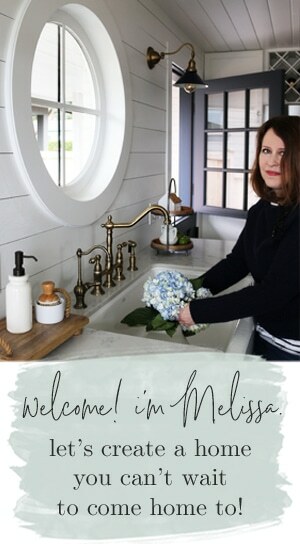 I will be doing my kitchen remodel this summer and was dreading the process of looking at appliances but after reading and looking at your videos and reviews, this is going to make the process more fun, educational and exciting. Thanks for sharing! Wow, that fridge – holy smokes!! I’m drooling!! I thought I was doing well because I finally have a fridge with water and ice on the door – granted, my fridge is probably 20 years old and I bought it with the house but as long as it still works it stays!! I’m sorry, but I have to join the “shame on Samsung” camp! We bought a Samsung HE washer and a matching electric dryer just over two years ago, and already we have had to replace the main circuit board in the dryer (to the tune of $311.82). And it happened just a few months after the warranty expired. I called Samsung customer service to say that the most important part of a dryer should last longer than two years–my old Maytag dryer lasted 25 years with only one repair! Customer service just gave me the runaround, and I had no comeback because the machine was no longer under warranty. Never again will I purchase anything by Samsung. Be sure to research carefully before buying a Samsung refrigerator. 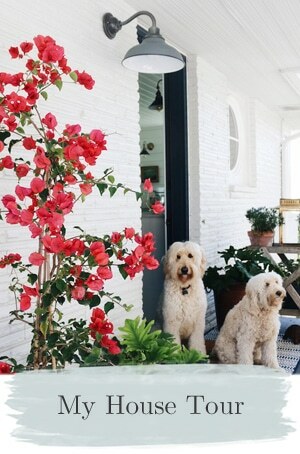 I’ve had a French door model for about five years. While I love it’s features, it has had lots of problems: sometimes defrosts for no reason, freezer gets thick ice build-up under drawer, upper ice maker door freezes shut, leaks water, makes disturbing noises, doesn’t know the difference between crushed ice and cubes–does one or the other no matter the setting. I looked at consumer ratings on similar model on Amazon recently, and 81% gave it ONE star! Getting new appliances is exciting. 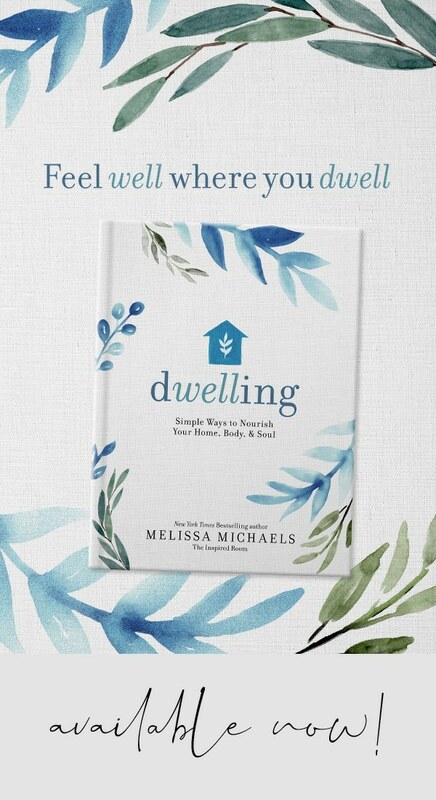 Best of luck with making your new house your own. I truly enjoy your blog. I would be wary of any fridge that relies solely on a control panel (computer). We had a samsung fridge that lasted only 5 years before the control panel went out, and at that point after 3 different professional opinions, we had to throw away the fridge and get a new one. They don’t even repair samsungs with a bad control panel because the parts are too expensive. All three professionals said samsungs are notorious for short lives (if they only have a computerized control panel, and no manual controls). We have had samsung washer and dryer with better luck though.